Back to Basics: Multiplication is NOT the Inverse of Division! The bottom line: it’s wrong. And, since it does cause confusion for some, it’s a good idea to stop saying it. Basically, it is an oversimplification. Here’s what is really true: If you pick a nonzero number N, then multiplication by N is the inverse of division by N.
The problem is that because of this mantra, I’ve seen students get into conceptual difficulties later when they encounter inverse functions. Because of the mantra, they try to regard multiplication and division as inverses to each other, when, technically, they aren’t. When we say that an operation is the inverse of another, we mean that the operation undoes whatever the other operation does. Multiplication takes two numbers and returns a single number, their product. To invert this, we would have to start with a single number (the product) and return the original two factors. But we can write every number as a product in an infinitude of different ways. Technically, therefore, multiplication does not even have an inverse. On the other hand, if you fix a nonzero number N, then multiplication by N is inverted by division by N. In functional notation, the functions and are inverse to each other: Both and . There’s a more conceptual reason why we should stamp out the mantra: Multiplication and division are actually two ways to look at the same thing. They are like two different views of the same elephant. Indeed, if you don’t like division, you don’t have to use it because you can always use multiplication instead. And, except for multiplication by zero, the same is true the other way around. For example, if you’d rather not divide by 5, you can always multiply by 0.2 instead. Let’s make the point clear with a visual image. Because division by zero is undefined, let’s restrict our attention to positive numbers only. 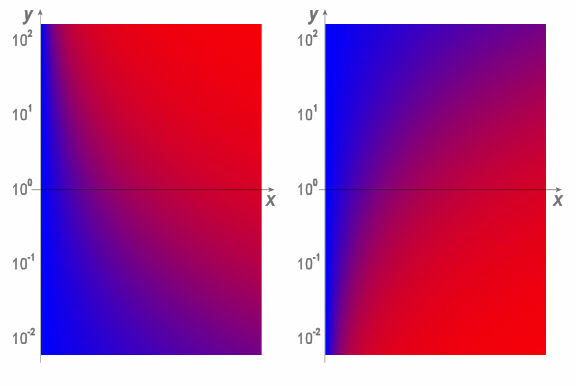 We can represent multiplication in the first quadrant of the plane by setting the temperature of each point to the product of its coordinates. We represent division analogously. Now let’s twist this representation slightly by working on a piece of semi-log graph paper instead of the first quadrant. See below. Color indicates temperature. In one rectangle, temperature is given by the product . In the other, temperature is given by the quotient . Does one rectangle look like an exact mirror image of the other? It should, because they are! Multiplication and division are just two ways to look at the same thing. Hopefully, you’ll never carelessly say “multiplication is the inverse of division” again. This entry was posted in math, Math Education and tagged division, inverse functions, misconceptions, multiplication. Bookmark the permalink. 3 Responses to Back to Basics: Multiplication is NOT the Inverse of Division! Well, I was convinced until the heat map. If the division heat map was inverted vertically wouldn’t it look exactly the same as the multiplication map? That was very illuminating, thank you.